The Pantone color of the year for 2014 has been announced: meet Radiant Orchid! 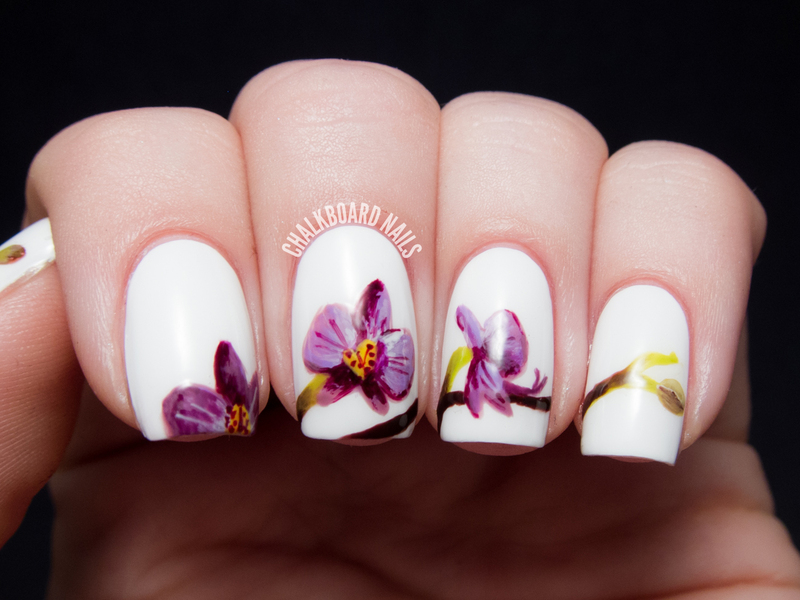 Pantone’s executive director describes the shade as “an enchanting harmony of fuchsia, purple and pink undertones.” I think radiant orchid is a beautiful shade and I did my best to represent it in this freehand orchid nail art. I started this nail art by pulling out all of the polishes that I had from the orchid color family. Strangely, I didn't really have anything that properly matched Pantone's shade! I figured I could combine a few shades that were close and the overall effect would read "radiant orchid." I think I achieved that, what do you say? I mixed some of the colors together in varying amounts to create the transitions between shades, where necessary. 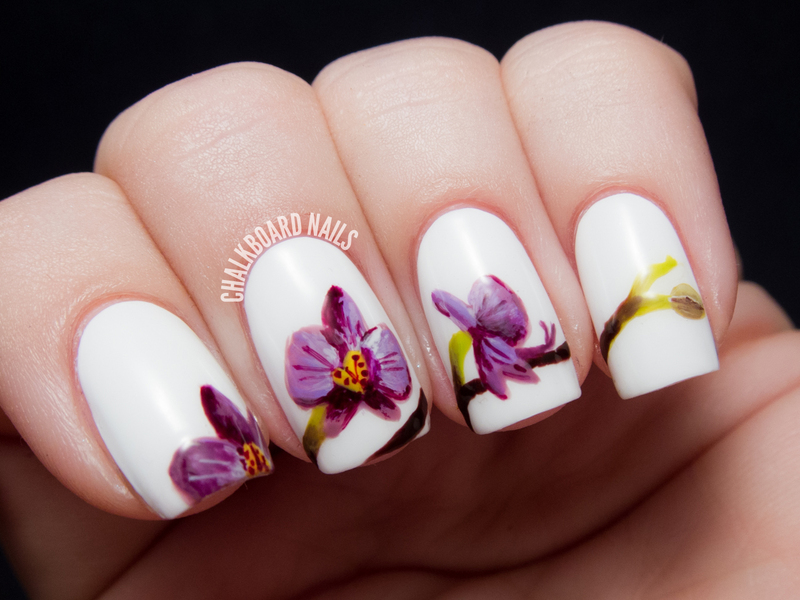 The whole manicure is freehand painted with a small nail art brush. I wanted to go for a design with a lot of negative space so the flowers would have a bigger impact. 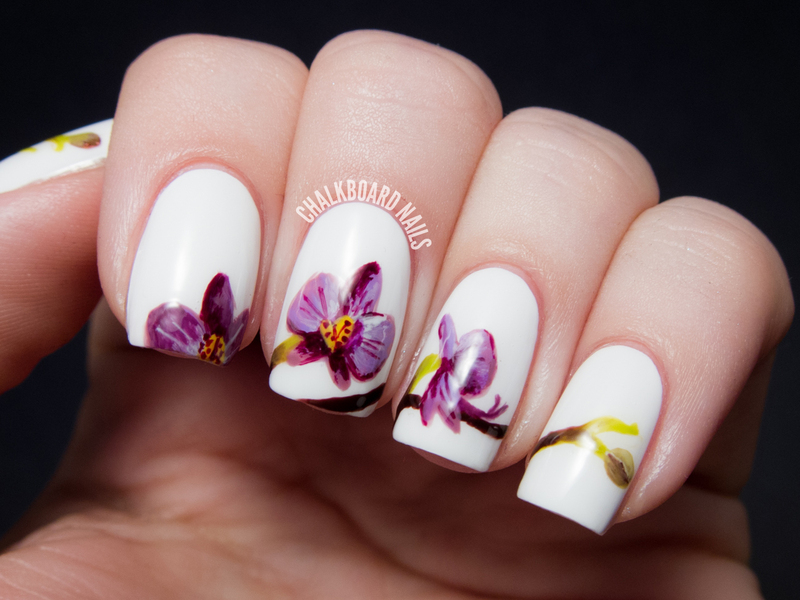 I painted the orchid branch coming up from the tips of my nails, connecting across all four of them. The branch ends in a bud, which is pretty adorable (if I do say so myself). I painted another bud on my thumb to tie it in with the other nails without distracting from the main branch. How do you feel about Pantone's color of the year? Do you think I accurately represented "radiant orchid" in this nail art? This is gorgeous, and a great way to show the 2014 Color of the Year! Oh wow, I love your presentation! I think you did it justice :) and that colour is just so stunning! Wow! Unbelievable! These came out so pretty, so pumped about the color of the year...was not a huge Emerald fan...haha. This is so gorgeous! You definitely succeeded -- and then some!! Not sure how I feel about Radiant Orchid as the Pantone color of the year, as it's not really a color I veer towards. Maybe it will get me out of my comfort zone. It's beautiful !! I'm always impressed, I was thinking that it was a set of stickers for nails !! Concerning pantone color, I was more into Emerald than Radiant Orchid but maybe it will be appealing to more people than green ? My jaw is in my lap! Very beautiful! And yes, it is very similar to the color. It is entirely possible that this is the best nail art I've ever seen. Simply beautiful. I thought these were stickers, they look so real! Stunning! I'm at loss for words...it is just one of the most beautiful nail art I have ever seen!! Gorgeous! Clearly at The Orchid Boutique we are thrilled at the color choice of the year ;) But this nail art really goes the extra mile. Absolutely gorgeous! Real art work - it must be shared! My, the fuschia and lime/green colours go amazing together! wow, these are so perfect! I'm glad that you used a mix of shades... it looks like a watercolor painting. Top of your craft; I absolutely adore it. This is absolutely beautiful! Your nail designs are by far some of the most beautiful that I've ever seen. Perhaps you could do a step by step instructional guide of how to achieve this design? It's gorgeous. I'd love to see the process. 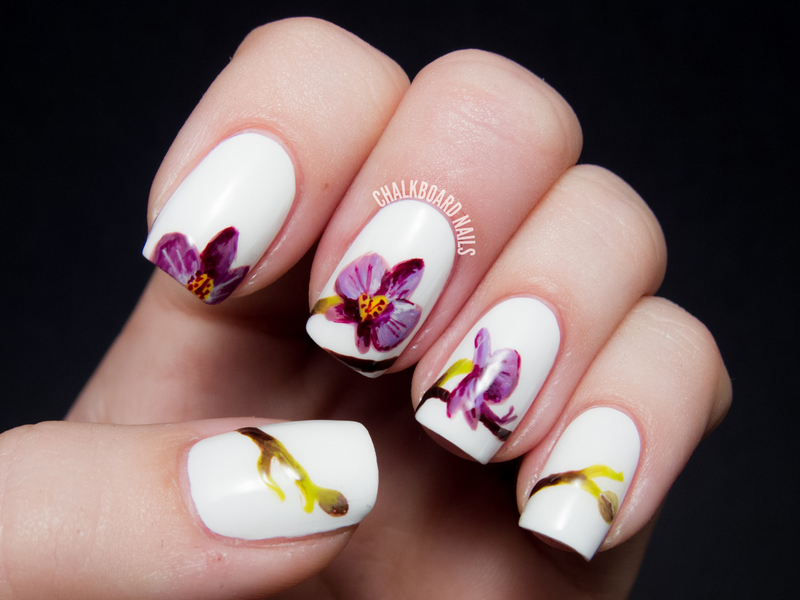 This nail look is absolutely beautiful as everyone has quite rightly commented! You've done a fantastic job. This is absolute gorgeous perfection! I'm going to use it in a post featuring my Friday Favorites. Full credit will be given but let me know if you prefer I don't use it. How did you get the colour effect to make it look nice? Did you use any quality nail varnish? I don't think it's ever too late to say: these are absolutely BEAUTIFUL!